Beet and Walnut Spice Muffins | What Smells So Good? I'm so ashamed - I totally forgot to write my post for the 12 Weeks of Christmas Treats! Luckily, the list is open for a few more hours, so I'll sneak this one in. 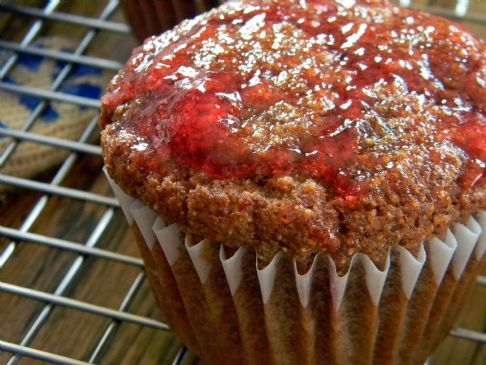 These muffins came about after I harvested my garden plot of candy cane beets this year and was looking for something to do with the extras that my mom and I just couldn't get through. Like the last beet muffins I shared (also for this event! ), these use the beets for moisture as well as a rich, somewhat earthy flavour that really plays well with the spices. I added a simple warmed Crab Apple Jelly glaze on each to add a bit of sweet tang and make them a bit more festive than your usual "coffee shop" fare. Though I was inspired by a recipe I found in 500 of the Healthiest Recipes and Health Tips You’ll Ever Need, the original used xylitol which, though available in the local health food store, as a poor girl still squatting with her mom and stepdad I just couldn't afford to buy. I did have stevia for baking and honey on hand though, since I use both of them in my personal cooking, and so I opted for the combination. I also cut down the oil in the original (for a "healthiest" recipe there was a lot of it! ), adding homemade applesauce instead. The spices and nuts were a nice rich element that helped them stand out at the office! Preheat oven to 350F, line 9 muffin cups with paper liners. Beat together the honey, oil, applesauce, eggs, stevia and beets until well blended. Stir in the flour, baking powder, spices, salt and walnuts until just combined. Bake for 30 minutes. Remove from the pan and brush with the jelly.